The Vicuña is considered to be a wild type of Camelid. They are very closely related to both Llamas and Alpacas. They produce wool that is very fine. This can also be very expensive because the animals can only have their wool removed every 3 years. This animal is the National symbol of Peru. The Vicuña offers wool that is very long and very fine. It is brown in color but the shades of it can significantly vary. They also have areas of white on their sides and on their legs. The face is white as well. They have a small head with very small ears. The body of the Vicuña can range in length to a size of about 5 feet. They are about 3 feet tall with a mature weight of about 150 pounds. 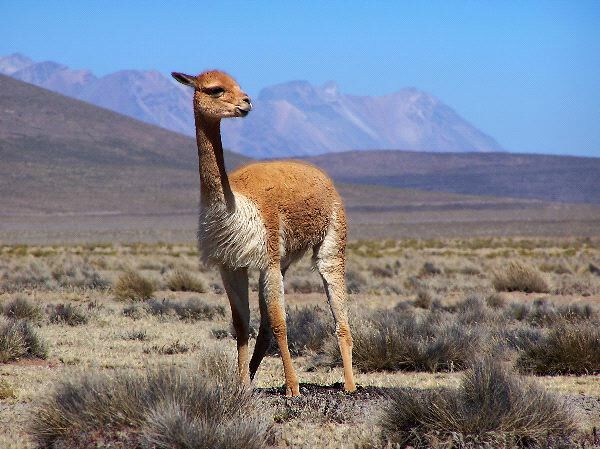 South America is home to the Vicuña. They live in the very high regions of the Andes. They are found throughout Peru, Bolivia, northwest Argentina and the Northern part of Chile. The largest number of them live in Peru. Thanks to human efforts there are now numbers of them living in Ecuador as well. The Vicuña is very graceful in its movement. During the day they are on the plains but at night they move into the slopes of the Andes. They are able to live in the cold night time temperatures even though their wool is very thin. Their bodies allow them to trap heat from the sunlight during the day to their skin and that keeps them warm through the night. They are very shy and they listen well to their surroundings. By doing so they are alerted to any threats or problems in their environment. They live in herds that have a dominant male and up to 15 females. They also include the young that those females are carrying for. 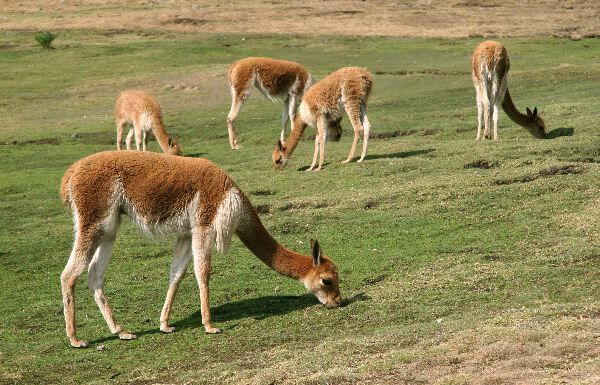 The grassy plains serve as the feeding locations for the Vicuña. They eat the grass that is very low to the ground. What they feed on is in clumps and often it is what other animals have left behind. They do move around often as they eat and that prevents problems with areas being over grazed. They are often seen licking rocks to get enough salt. They will also consume salt water. They can go for several days at a time without any water. Their bodies do need salt though. If they don’t get water that offers it rocks are very simple to find in their environment. The dominant male is the only one that can mate with the females in the herd. However, that leader changes very often. Bachelor males that are strong and healthy will fight with the dominant leaders for that position. If they are successful they will take over the herd and that previous leader will wonder off alone. March and April are the months when mating will take place. After mating it takes up to 11 months for the young to arrive. It is very typical for them to only be 1 but there can occasionally be 2 born. The young will feed on milk for about 10 months but stay with the mother until it is about 18 months old. In 1974 the Vicuña was considered in very serious danger of becoming extinct. There were only about 6,000 of them left. Thanks to conservation efforts though their numbers have increased. Today there are about 350,000 of them in the wild so they are no longer considered to be at risk. However, there are still laws in place to protect them from poaching.